Detecting if your bearded dragon is sick can be a rather tricky business. They don’t yelp or screech; so you’ll have to be an observant pet-owner to catch the infection. The thing with this ailment is it’s easily seen if you’re attentive enough. Just like any other illness, it is easier to cure if it is discovered early. Infectious Stomatitis, the technical term, literally means that the mouth (stoma) is inflamed (itis). It is common among pet reptiles, so bearded dragon owners have to stay on guard. We will be discussing further characteristics associated with this condition, the circumstances that cause it, the cure towards recovery, and the optimum care needed to avoid it in the future. Need Help To Get Started With Bearded Dragons? Identify it from patches that appear whitish-gray or yellowish-gray around the oral cavity. Other bearded dragon mouth rot symptoms include reddening, bloating, and increasing saliva emissions. You also would have noticed a loss in appetite and deviation from your beardie’s regular behavior. Much as it pains us to see, a bearded dragon with mouth rot have symptoms that include bleeding of the gums or loosening of teeth. It’s high past time for you to consult a veterinarian when any of these happens. Left untreated, the infection can spread to the head, bones, intestines, and the blood. A large factor in this is the living condition of your pet. A stress-filled environment lowers the immune system’s defenses. Low temperature, lack of proper nutrition, and presence of parasites are the main things for us to watch out. You should note that mouth rot is the manifestation of the disease affecting bearded dragons. The actual cause could be bacterial, viral, or fungal in nature. Since it is an indicator of infection, wide-range antibiotics are usually used as medication. As I said before, if detected early then it can be cured easily. Once the infection advances, professional medical help is your best and safest bet. 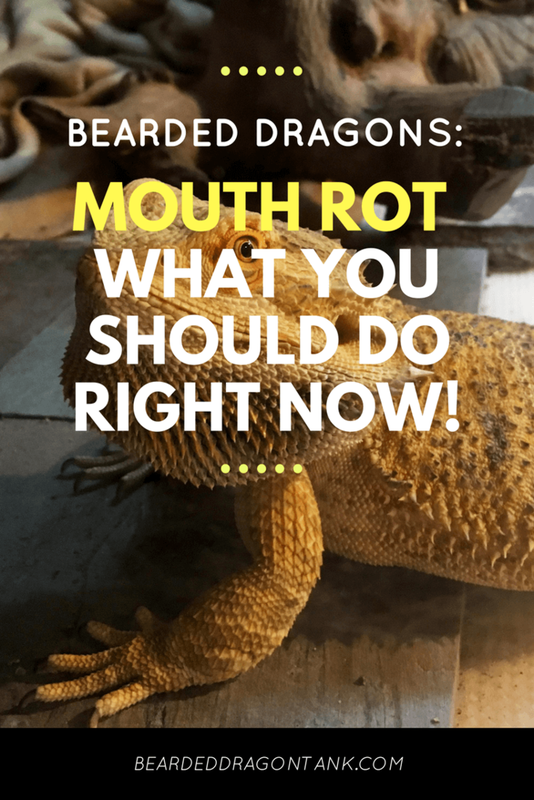 Recognizing the infection, when it has barely affected your pet, means that you have the chance to administer at home bearded dragon mouth rot treatment. Trust your gut in this, if you’re sure that it is not widespread, then be proactive and grab the Q-tip. You will need Betadine (povidone-iodine) or Nolvasan (chlorhexidine diacetate) mixed in water to decrease the potency of the solution. Using a cotton swab, gently apply the medication on the affected area. Remove the gunk and be very sure to rinse well. It will not do for any piece to stay in the mouth; else your beardie swallows it. You can repeat the process twice on the first two days of treatment, but reduce thereafter. If the infection persists, then veterinarian assistance is still the best course of action. You’ll notice that I’ve mentioned consulting a veterinarian several times. It’s understandable that you might prefer not to, especially if you’ve had a dubious encounter in the past, but there are still reputable vets out there. The advice here is: Find a vet who has expertise in reptiles. We can’t just leave our pets to the whims of any doctor, so find a trustworthy vet around your area just in case complications happen. Resist from self-prescribing medicine for your pet. Overdosage in antibiotics would only make your beardie develops higher resistance to the drugs. The worst case scenario is when it is tumor-in-disguise. Don’t jeopardize the health of your pet and consult a veterinarian before any disease worsens. Most of the time preserving your pet’s health simply requires optimizing the basking heat in the tank at the right temperature. During recovery it would be best to turn up the heat a notch and don’t turn it off at night for the time being. Bearded dragons need the warmth for their metabolic processes to proceed at what is ideal. Here is my Beardie Lighting Guide in case you need help with that. A good UV lamp is enough but UV light is still best acquired from its natural source– sunlight. Weather and season permitting, you can take the chance to bond with your pet outside. It’s fine to stay under the shade as long as you’re both out in open space. Direct and too much sun is inadvisable as you cannot expose a convalescing beardie to burning heat. In simple cases, I have found that homecare and supplementing Vitamins A and C perk up my dragon. Adults require vegetables and fruits to add variety in their diet. These will also serve as their source of water. If you’re force-feeding, opt to use a syringe so any discomfort and pain will be minimal. Whether it is glass, melamine, or PVC, the tank of your pet is their home and it is integral to their health. Always prioritize and maintain its cleanliness. Its décor should be as uncluttered as possible; more surfaces just indicate more chances for bacteria to prosper. Still, enclosures should mimic the natural habitat to increase comfort. Bearded dragons, particularly when they’re young, feel safe in enclosed spaces. It would great to have basking rocks which double as caves. Choose non-porous material so germs will not seep through it. Some bearded dragons will not go through this, but others will and the signs for brumation are commonly mistaken as an illness. There will be periods when your beardie is extremely lazy; it won’t eat, it just sleeps continuously. It could be there perfectly natural adjustment to the fall/winter season. However, losing weight is definitely not part of brumation. Healthy adult dragons will have enough fat that going through their reptilian hibernation will not make them anorexic. An absolute exception is that young beardies which are yet to store fat do not go through this phenomenon. Learn to objectively differentiate what you pet is going through. Puffiness is normal and not fatal during shedding. All you need is to have a mister at ready and give your pet time to grow out of their old skin. Remember that bearded dragons will continually shed throughout their lifetime. Our beardies give us strength simply by their existence in our lives. In turn, we provide for them and become their strength when they are weak. We are lucky enough to have gotten a companion in our pets, so let us treasure the company we keep. Author beardeddragontankPosted on July 9, 2017 Leave a comment on Is Your Bearded Dragon Suffering From Mouth Rot? Do This Now!